The myth: carrots can meaningfully improve your vision. Like most myths, there’s a bit of science behind this mostly-untrue thing your grandmother probably once told you. In this case, the culprit is vitamin A. Vitamin A helps maintain your eyesight, and carrots have a lot of it — a 100 gram serving has 104% of the USDA recommended amount of the vitamin. But vitamin A won’t improve your eyesight and, contrary to a similar legend, it won’t help you see better at night. A pretty easy-to-understand misunderstanding, right? A simple extrapolation, gone too far. The truth: the myth comes from a quirky World War II misinformation campaign. In the late 1930s, around when World War II began, the United Kingdom feared that Germany was developing “death rays” which could melt a plane from the ground. While investigating the feasibility of such a weapon, UK researchers determined that such a doomsday weapon likely couldn’t exist. But the theories that were being floated and the advancements to date yielded something else — a way to detect (but not incinerate) the planes as they approached. The UK became the world’s leaders in radar technology. While it wasn’t a death ray, radar was pretty powerful. German pilots engaged in bombing runs over Britain, many of which occurred at night, under cover of darkness. But these advances in radar technology allowed the British Royal Air Force (RAF) to shoot down a large number of German planes — more than German tacticians believed likely. So the Germans went looking for a cause, in hopes of neutralizing or replicating it. The British provided one: carrots. The RAF told newspapers that some pilots were better shots at night than during the day. As the story went, the thing that set them apart was that the night-flying aces ate extra carrots in an effort to improve their vision in the dark. The Germans were fooled — and so were many British citizens as well. The UK instituted blackouts in order to make it harder for German pilots to find the targets of their evening air raids. This meant that British civilians had to navigate the streets at night with little light. 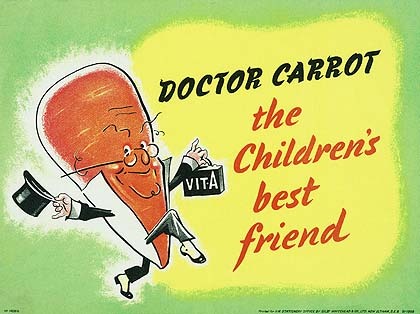 The British government embarked on a “Doctor Carrot” campaign (one such ad seen above) encouraging their consumption, and left the vegetable untouched by wartime food rations. British citizens began growing carrots, in hopes of improving their vision during nighttime blackouts, giving further credibility to the ruse. Bonus fact: Despite falling for the British ruse, the German military explored the use of infra-red technology as a way to improve vision at night. By the end of World War II, a few dozen German tanks were outfitted with infra-red search lights. From the Archives: The Nazi’s Chocolate Bomb: Another World War II food of war. Related: A book showing 150 U.S. World War II propaganda posters. 4.4 stars on 5 reviews.